The Multi-Products Company of Oak Park, Michigan, founded in 1947, was one of several manufacturers of specialty amateur products. 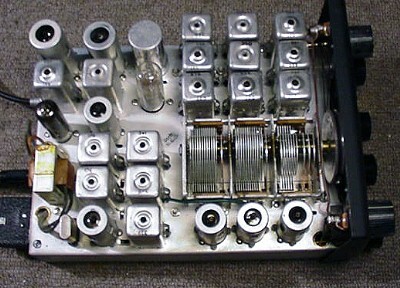 For a decade beginning in the early 1950s, the company produced mobile amateur band receivers and transmitters, the PMR-8 shown here being the latest version of the receiver. The PMR-8 was generally paired with the matching AF-68 transmitter. In 1976 the company was acquired by the Stanley company, a maker of garage door products. 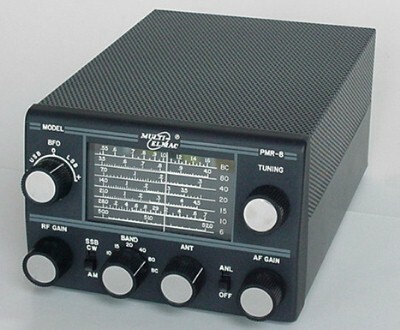 The above radios, along with a matching M-1070 AC/DC power supply, were owned by the U.S. Senate Amateur Radio Club, and were reportedly donated to the club by the late Barry Goldwater, K3UIG. The radios were never unpacked by the Senate amateurs, and when the club disbanded in 1999 I was lucky to acquire the three pieces in their original boxes. Why didn't the radios ever get used? A possible explanation is that Multi-Elmac expected users to wire up their own multi-conductor power supply cables, and doing so wasn't practical for the busy club members. Features: The PMR-8 tuned the six amateur bands from 80-6 meters. Six meter coverage was an unusual feature for mobile receivers of the era. The radio also featured a tunable BFO for CW and SSB reception, a series-gate noise limiter, AVC, antenna trimmer, and 1W audio stage. An external S-meter, speaker, and AC/DC power supply were available as accessories. A headphone jack was provided on the rear chassis. It's hard to imagine fitting anything else onto the PMR-8's chassis! The density of IF cans and tunable coils seems unusally high. 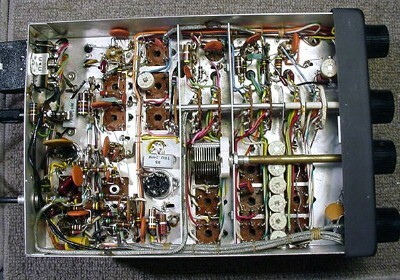 Circuit Description: The nine-tube lineup used a straightforward double-conversion superhetrodyne design, with a 6KD6 RF amplifier, 6BE6 1st mixer, 6BE6 2nd mixer, 6BA6 IF amplifier, 6BJ7 detector/AVC, 6AW8 audio preamplifier/BFO and 6AQ5 audio output stage. An interesting circuit twist was a 3TF4 filament voltage regulator. The first IF is at 2238 kHz and the second IF is 262 kHz. There is only one stage of IF amplification. Under the Hood: The mechanical layout of the PMR-8 showed the maturity learned from the earlier PMR-6 and PMR-7 designs. The organization of components was straightforward and neat, with good access to tube socket pins, IF can slugs, and trimmer capacitors. The radio is surprisingly easy to service, given its compactness. Performance and Operating Impressions: This is a nice little radio, with good stability and sensitivity, and excellent fidelity audio that will blow your socks off. It works well on SSB and CW with its tunable BFO which, interestingly, has calibration marks for LSB and USB. The selectivity is about what one would expect for a simple, mobile receiver; the comprehensive and well-done operating manual notes the selectivity as 6 kHz at 3 db down, and 30 kHz (!) at 60 db down. Small, Smaller and Smallest: Although it is hard to imagine a more compact vacuum tube receiver than the PMR-8, the radio looks positively massive compared to the transistorized Davco DR-30 and the tiny little Regency ATC-1 converter. Despite its smaller size, the Davco outgunned the PMR-8 with mechanical and crystal filters, a rotating-drum linear dial, dual product and AM detectors, notch filter, crystal calibrator and noise blanker. Do you think this solid-state craze will catch on? Click HERE to go the AF-68 "trans-citer" page. Visitors since Dec. 15, 2001 Andale.